Home / Blog / What are Stokkies? We all know about the biltong, but what exactly are stokkies? Well, we, the experts, are here to explain. Stokkies (meaning “little sticks”) are thin strips of our famous traditional beef Biltong. As they’re thinner, they dry out quicker and become chewier. You eat them by holding it in your hand and knawing in front of the TV. 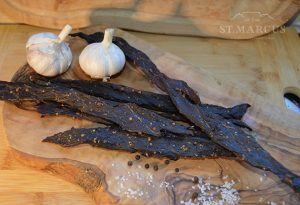 As a general rule, if you like dry biltong, you’ll love Stokkies. So now you can enjoy a guilt free nibble that also offers you a good source of nutrition. They come in a huge range of flavours, such as our NEW Earthy Black Pepper or if you prefer something more subtle, Delicate Garlic Beef Stokkies. So, what do you think? Are you stokkies fan, or prefer good ol’ biltong? Get social and let us know on our social media!